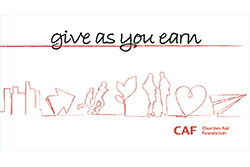 Give As You Earn is a brilliant way to make a regular donation to the Trust, as your donation is taken from your pre-tax salary. This means that part of your donation comes from money that would have otherwise gone to HMRC. If you are thinking of or already do make a regular monthly donation to the Trust, then G.A.Y.E is a more tax efficient way of making that donation.